Gardening and sewing...what else is there? by walking my legs off with the mower. Looking a little snaky here in the picture but that was before I arrived with the mower. why, Jack could almost climb that bean stalk! it turned out wearable! I do want to make one and put ruffles all around and a big gathering pocket on the front. This one was just a trial run, made from a piece of muslin, but I really do like it!! Better go friends. Here it is bedtime once again. Thanks for looking in. Thank you for your kind comments about our "Big Boy" passing away. We sure have missed him. Big Boy's son. There were three roosters in the bunch. We've just recently found a home for the two others. They had begun to fight. I'm so glad we kept this one. He looks a lot like his big old daddy, doesn't he? He started crowing lately and sure is proud. Hope he has the personality his daddy had. Someone asked how long Big Boy had been with us. Probably about ten years. Neither of us can remember exactly when he showed up here. You may remember how Poppy and I got up early one morning and found Big Boy in the goat's lot. Someone slipped in after dark and threw him over the fence. We've got peaches! Remember last year how I ranted and raved and swore that one way or another, we were going to have fruit trees, that actually bear fruit. I read and read about what fruit trees need. I made myself a monthly chart, and bought all the different sprays needed. Well I got slack, as usual, and our pretty peaches have sticky stuff on the ends and some bugs holes. Poppy said, Mel, I could have told you, you needed to spray as soon as the flowers open the tree. Growing up, Poppy and his two brothers picked peaches to earn money. That was down in the Sandhills of North Carolina, still well known for growing peaches. little patch of purple coneflower. But, where's the purple? It was raining that day and all the guineas were lined up on the fence to dry off. By the time I got back with the camera, they were flying down. Guess I had better go. It's bedtime again! I am totally beat!! Been mowing all day!! 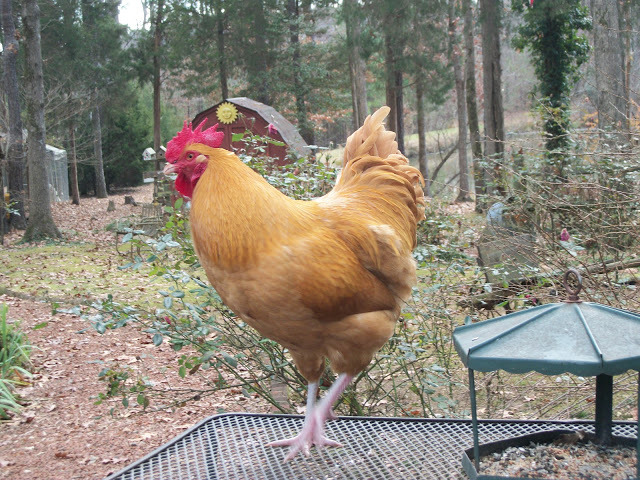 "Big Boy" aka "Mr. Rooster". Big Boy died this morning. He had been doing poorly these last few days. He will surely be missed, as he was always by my side whether up at the garden or down near the pond. 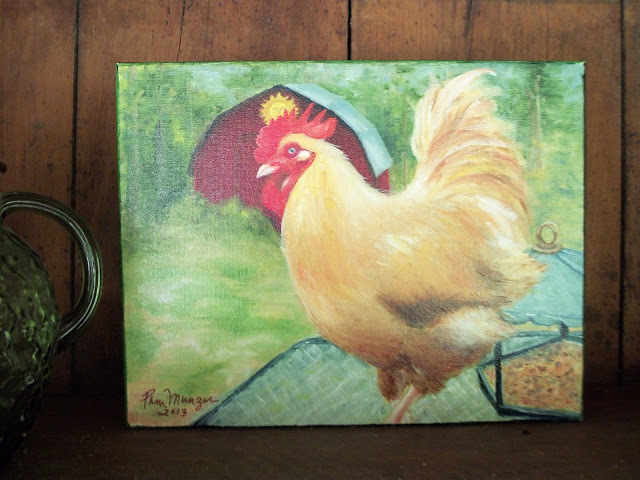 Big Boy was the kindest, sweetest rooster in the neighborhood. He was always the first one out to greet a visitor, or anybody getting out of their car here in our driveway. and was especially fond of our neighbor Ann as she brought him bread. Most of the time I had to tell him to "move back" so she could shut her car door. He was a friend to the duck and to the guineas.. He waited patiently for me as I fed the other animals. He fathered and helped raise many baby chicks here on Henny Penny Lane. It will be even more appreciated now. Thank you again, Pam. Better go now. Thank you for listening. It won't be the same around here without our friend, Big Boy. Thought I had better check in before you forget me. The weather here has been hot and humid and we've had thunderstorms. In fact, sometime during the night we had a storm, not severe, but lots of rain! 2 1/2 inches! and just yesterday we were bragging about how dark and pretty the pond was looking. This morning...muddy again! Friends, I have gone absolutely crazy over jumper aprons! If you go to http://www.pinterest.com/diegartenfrau/aprons-i-like/ and scroll down to the blue checked with the ruffle and big gathering pocket...be still my heart!!! I've simply got to make myself one! if the jumper apron turns out pretty, I will post pictures. Now to find time to sew! don't know yet what to make with the black cotton fabric with dresses...Did you ever see the bumper sticker that reads, "The one who dies with the most fabric wins". What is it about fabric! Still waiting for the the bell peppers to turn orange. We have four "orange" bell pepper plants, four green, four banana pepper plants, and four Jalapeno. Wish these would turn orange, darn it!! Here it is 8:40 and I really want to cut out that new apron tonight. Hope to be back soon. To my new follower...thank you very much. I'm sorry. Another picture of the house! It's just that I carry the camera when we walk Eli around the pond and well, I take pictures. Poppy lagging behind with the bucket of fish food. Obedient plants grow along the path. and this Carp came really close. This big fish, and several others, have been in the pond since 1996. Poppy says this one probably weighs 15 pounds. Ahhh, Monday! And to think how I used to dread Monday morning. That was back when I was still working as a secretary and driving to Raleigh every day. I wanted to be here...right here, in our new little log home...clearing and cleaning and building a teeny tiny farm. So, finally, retirement age...and my, how the years have flown. Now Monday is my favorite day of the week...when everyone else has to go to work. This morning, I've been busy cleaning the chicken house and patching the chicken wire fence. Aren't chickens messy! The hens were so sure that was feed in the wheelbarrow, not dirty hay. Here he is! He hangs out under the bean vines mostly, even though his water dish is under the squash vines. We need to give him a name. Poppy wants to tame him...which will probably happen. It has been years since we've enjoyed such pretty squash, and so many of them...so far, no squash bugs! Could it be help from the lizard? Hope I haven't jinxed us by saying so. Excuse the bandanna. I forgot to carry a basket. These are the orange bell peppers, so we are waiting. Do you think a carrot will grow in the half barrel? If so, it will be the first time in my life to grow an edible carrot! and here, the zucchini have stared to produce.